I’m always rattling on about how I’m not a fan of Las Vegas, but that’s not exactly true. 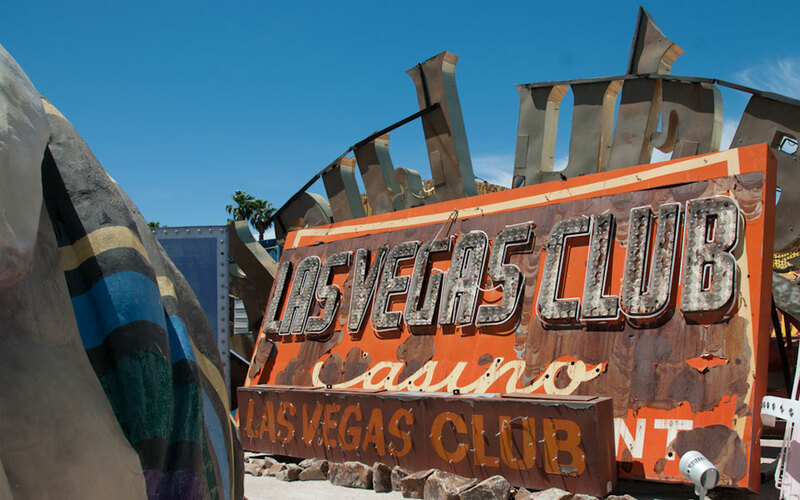 Last summer, we had a great family vacation in Summerlin and even on my 4th visit as a non-gambler, I was still fascinated by the people watching and the faux architecture of the Strip. On the flip-side, my recent conference at Caesars Palace confirmed all my suspicions about the Strip: the Vegas scene is just too amped up and nearly every restaurant is too overpriced to keep my happy. Thankfully, there are so many other possibilities once you get in a car and start exploring the rest of the city! 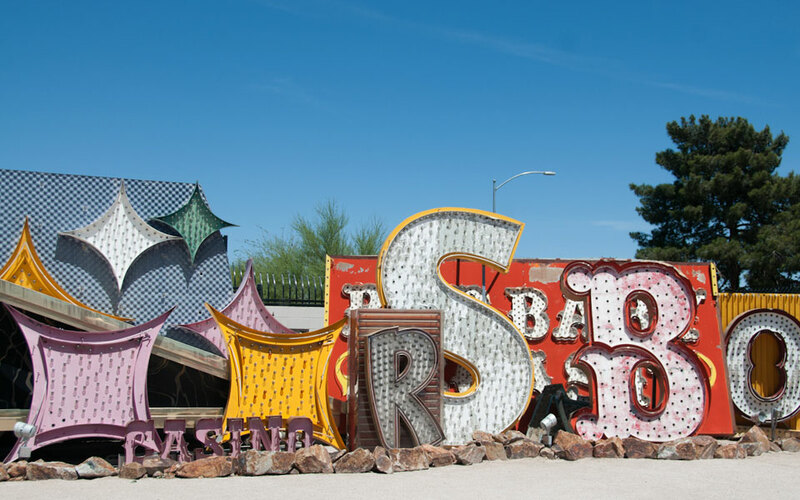 For years, the Neon Museum boneyard has been on the very top of my Las Vegas to-do list. 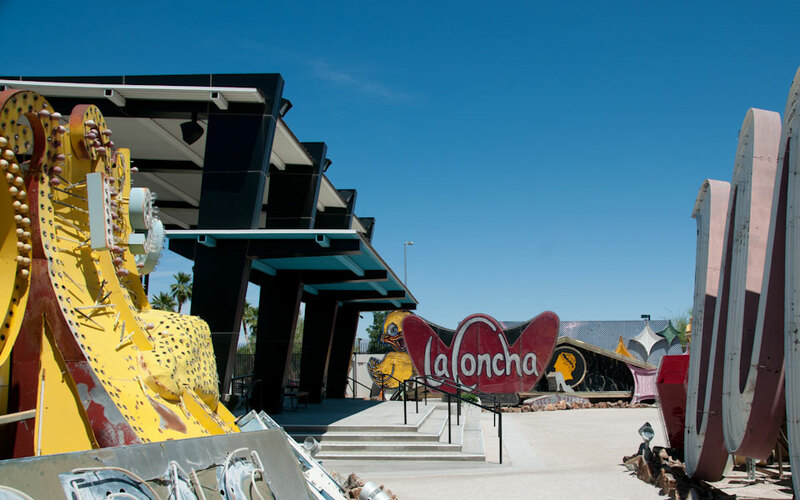 Just north of the older downtown casinos, it’s where an eclectic collection of LV’s most prominent neon signs have found a new home, once their advertising days came to a close. 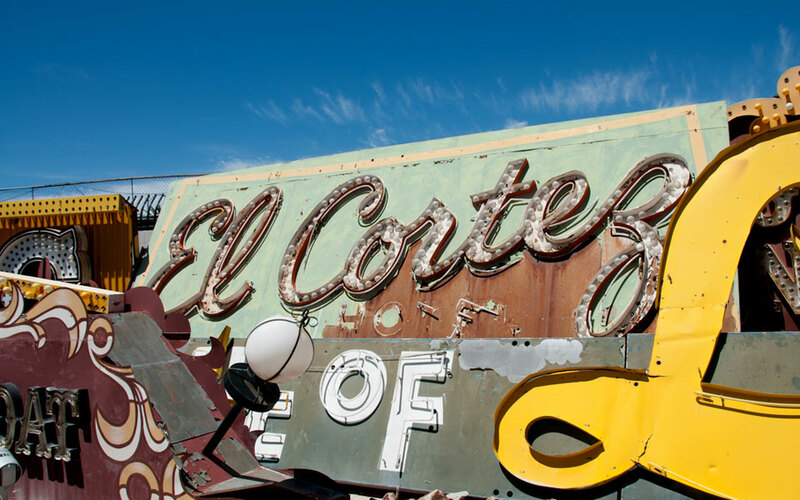 I’m in love with these salvaged signs. 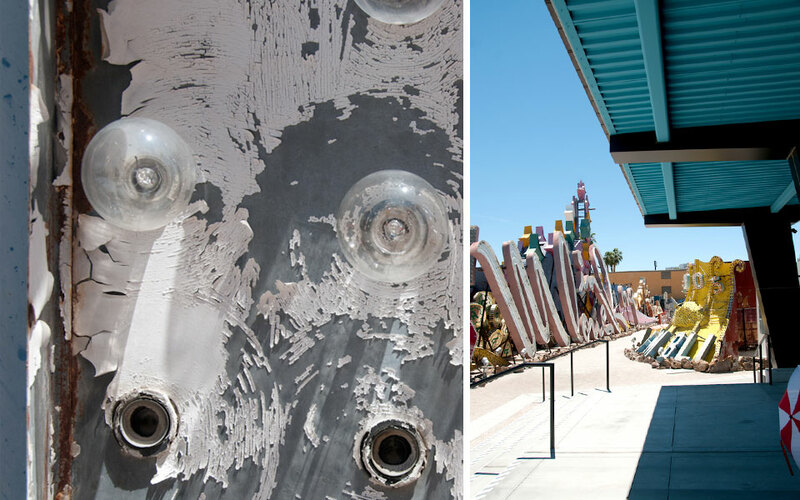 The broken bulbs, rust and visible wear represent the years spent enticing patrons into Sin City’s casinos, clubs and restaurants. 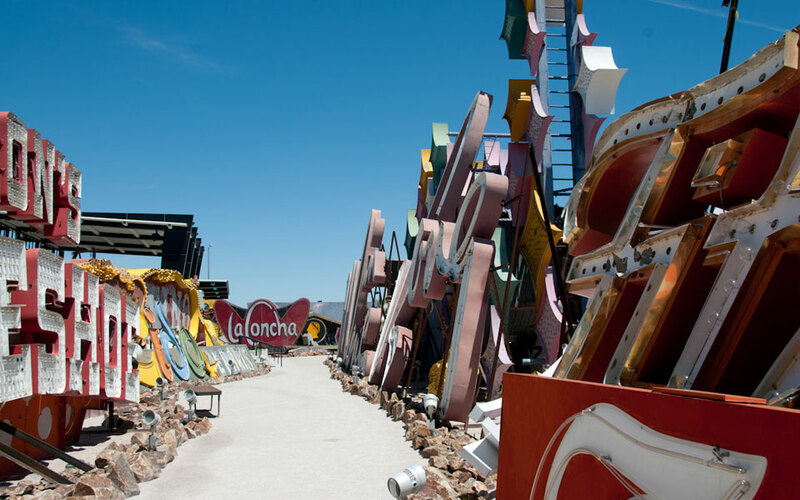 To tour this boneyard is to stroll through the history of Las Vegas hospitality. 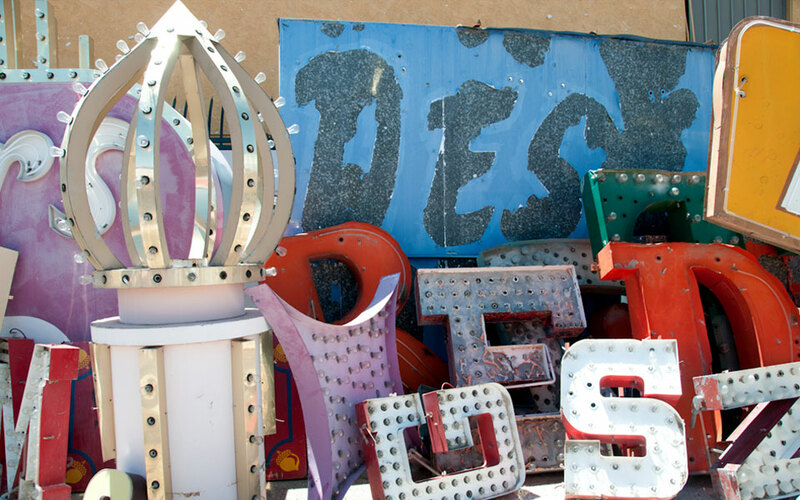 I picked a lousy time to take a tour, but the Neon Museum boneyard was still a visual treasure trove for photographs! The only way to see these retired signs is on an hour long tour at the Neon Museum. Tours often sell out well in advance, so be sure to book ahead!! My main reason for visiting Las Vegas was a conference, so I didn’t have much flexibility in my schedule to perfectly time an excursion off the Strip. What you can’t feel from these photos is the high noon sun and 90+ degree temp in early May! Hardly ideal conditions for someone who isn’t used to summer in the desert – and that would be me! There is a canopy providing shade (see below) and an occasional bench, but if you go – you can plan on standing, exposed to the elements, for the entire tour. Kindly, the museum does offer up shade umbrellas. 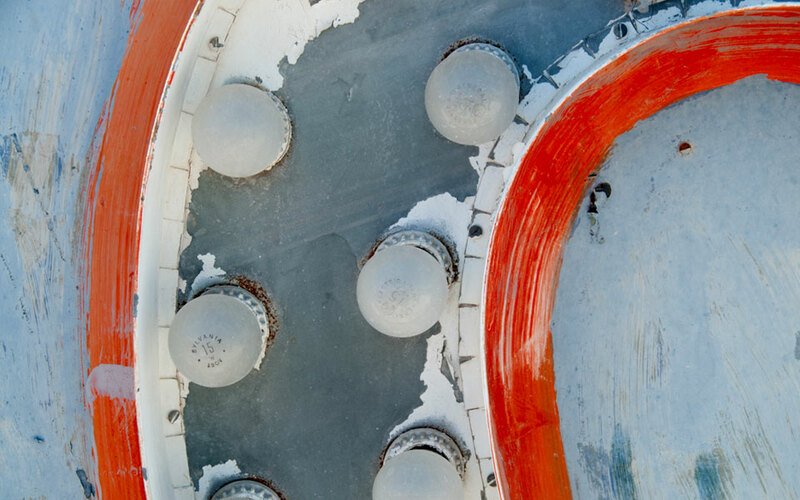 Above, you can spot a red + white umbrella that snuck into the upper left corner of my shot. Not used to the heat? I’ll be honest. It’s tough being out under the midday desert sun. I wanted both hands free to use my dSLR camera, so I brought a wide-brimmed hat and skipped the umbrella. While we blissfully waited in the air conditioned visitors center, I applied my sunscreen and bought a bottle of cold water to bring on the tour. Large backpacks and camera bags are not allowed, so travel light and leave as much as you can back at the hotel or in the car. Our tour of about 10 people was led by an enthusiastic guide. I was impressed by his knowledgeable insight into many of the signs and that he was completely undeterred by the heat! 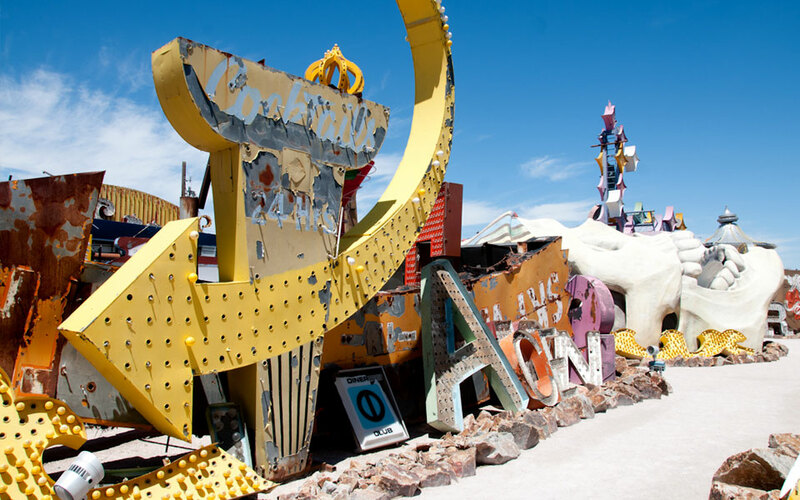 The 150 signs in the boneyard are grouped by time period or type of business. 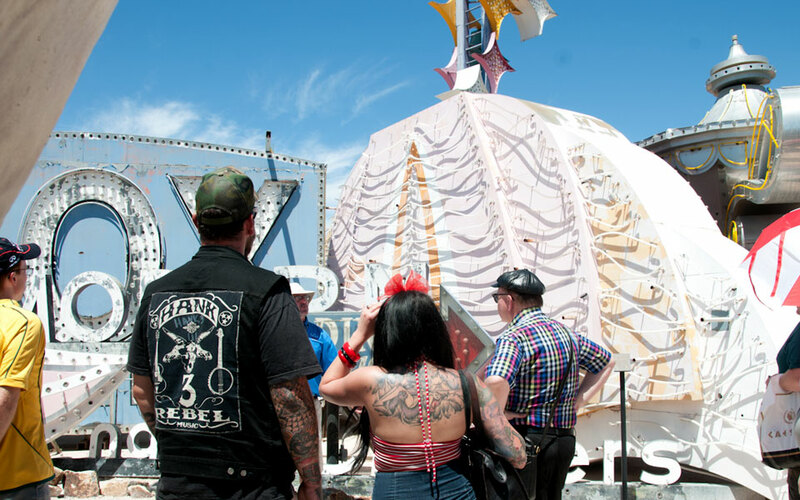 Unfortunately, there’s no opportunity to explore the boneyard at your own pace. In terms of photography, this can make it difficult to get certain shots or to spend extra time when you find something special. 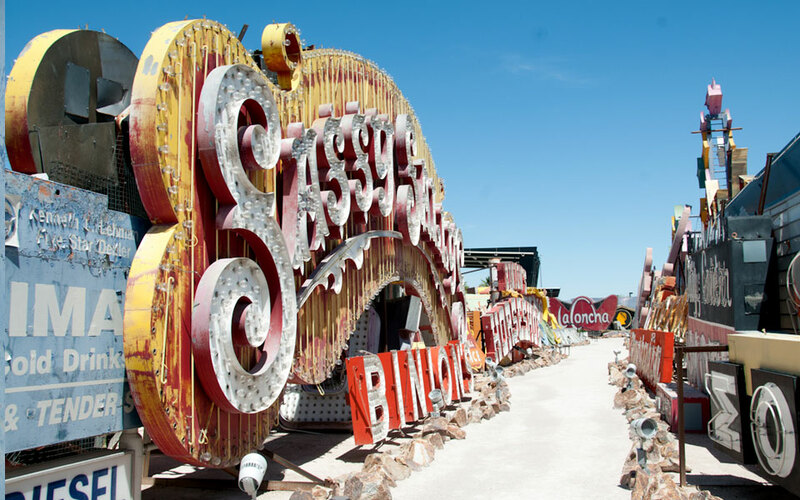 On the plus side: without visitors wandering everywhere, it’s easy to get clear, people-less shots of the signs! Next time, I’ll definitely book the night tour for a different perspective. 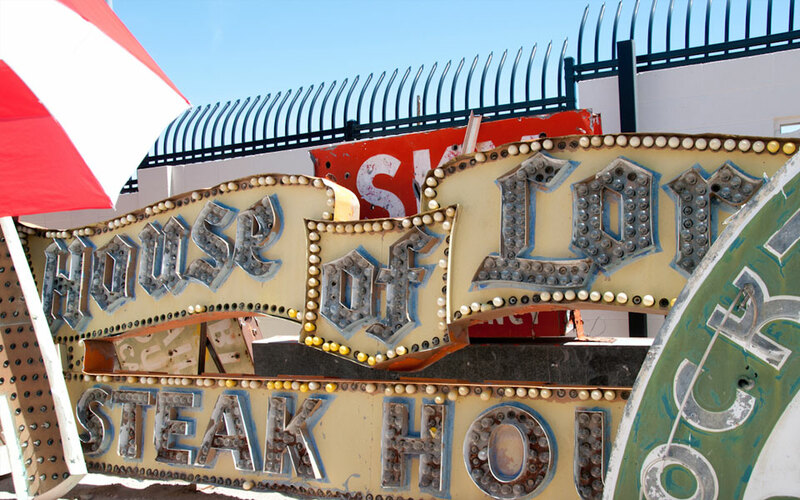 Six of the neon signs have been fully restored. Seeing them illuminated is an extra bonus on the night tour – along with a cooler temperature! 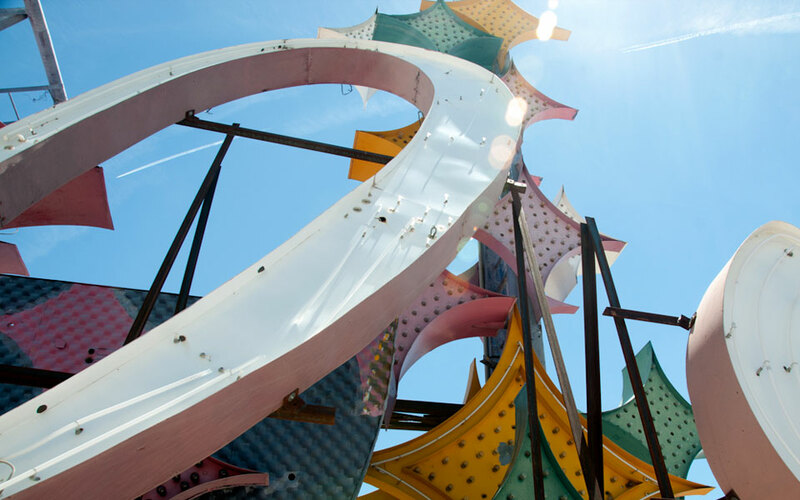 The Neon Museum is not close to the Strip. It’s just north of the downtown casinos and was about a 20 min car ride from Caesars Palace on the Strip. There is a free parking lot adjacent to the museum. 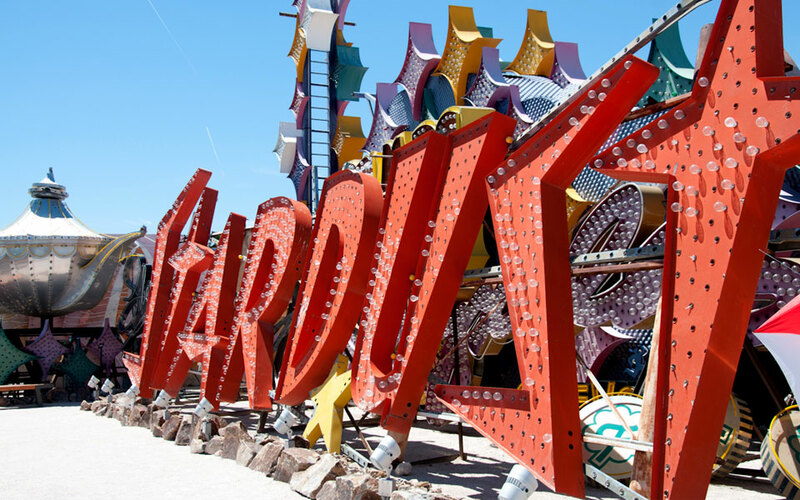 We rented a car on arrival at McCarran airport, but bus or cab rides are also an option, if you can spare the time (or money) to make it work. Once you’re in the downtown area, I highly recommend lunch at eat. My favorite sandwich of recent memory was the shrimp po boy! 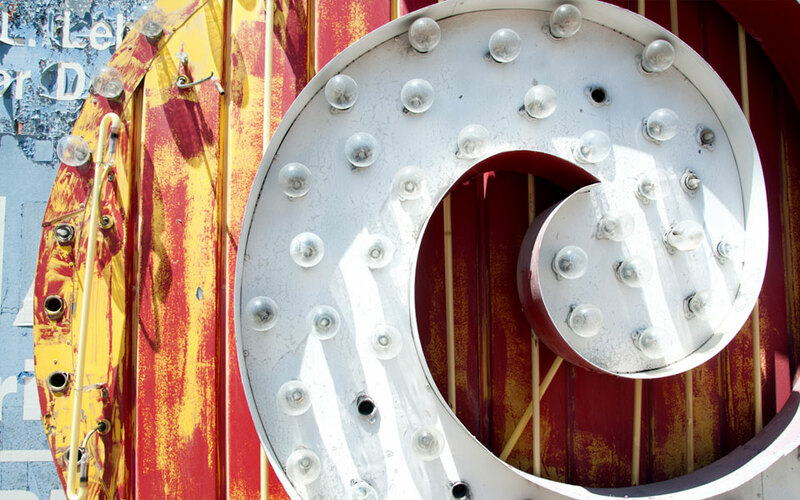 After melting in the midday sun, we headed south towards the Strip and rewarded ourselves with a frosty (and delightfully fluffy) treat at Kuma Snow Cream.